This sermon, offered by The Rev. Andy Jones at St Andrew’s Episcopal Church in Madison, Wisconsin, on March 17, 2019, is built around the readings for the Second Sunday in Lent in Year C of the Revised Common Lectionary. Sometimes a preacher wakes up in the middle of the night on Sunday morning, and something comes to them that changes everything they’ve been thinking for the past week. Sometimes that thing comes later in the morning when they get up and open the news sites on their computer, just to check, and they discover that what they’ve been doing all week is writing a sermon no longer works. Those are terrifying moments. But my experience this week was very different. All week long I thought about a sermon. I took notes. I jotted things down. And then on Thursday, when I actually set about to write, something about those words felt very familiar. So, I went back and looked, and sure enough, I was writing the same sermon that I wrote about this passage six years ago, in Lent of 2013. Now, while those middle of the night moments are pretty terrifying, you would think that discovering that I was re writing a sermon that I already knew really well would be a happy moment… but it was kind of terrifying for me to discover that that sermon still applies today, six years later. I have adjusted this sermon a little bit to account for the fact that I have now been to Jerusalem and stood in the place where this morning’s story happened. But hear again, a sermon that was written in February of 2013. Jesus said that he longed to gather the children of Israel under his wings like a mother hen gathers her brood under her wings… Is Jesus really talking about… chickens? I grew up in the Maryland suburbs of Washington, DC… Not a lot of contact with chickens there so I don’t know a lot about them, but the little bit that I do know got me in trouble one time. The summer after I graduated from college, I was with a bunch of coworkers in central Pennsylvania who were sure that I was a “city kid,” and having worked all summer to dispel that idea I blew it when around the corner of a building came the first flock of live chickens I had ever seen. I stood there transfixed, and when they asked me what was going on, I confessed that I was trying to figure out where the drumstick was… A little bit of knowledge can be a dangerous thing! Now, I don’t know a lot about chickens but I do have a pretty good idea of what happens when a fox gets into the henhouse. a Fox in the henhouse means panic, voices raised in terror and pain. A fox in the henhouse means the sound of running feet, carnage, blood, death. And when a fox enters the henhouse, there is nothing a Mother Hen can do but rush to her chicks defense, sacrificing herself to save them from the jaws of the destroyer. In today’s Gospel Jesus is responding to a group of Pharisees who’ve come to tell him that Herod wants him dead. And Jesus’s response to that threat, the threat from Herod the fox, is surprisingly dismissive. He doesn’t seem to be worried about his own life at all. And the language that he uses, the pictures that he invokes, his cry of lament over the children of Israel, shift our attention, and tell us that there is a greater threat here than the one posed by Herod. Jesus is pointing out that the children of Israel have a choice to make and that they have, for a long time, chosen to follow not the loving mother hen, but the fox! Herod Antipas, the fox who wants to kill Jesus, rules Galilee as a client state of Rome. He is a traitor, a collaborator, a participant in the oppression of his own people. He is also the son of Herod the “Great.” It was Herod the “Great” who had the innocents slaughtered in an attempt to eradicate the newly born King of the Jews that the Magi were seeking. Herod the “Great” had his own children executed for fear that they were plotting to steal his throne. So, Herod Antipas came from a long line of people willing to do anything, including killing their own chicks and the chick of others to maintain their hold on status, rank, privilege and power. You would think that a threat from this man would be enough to grab the attention of an itinerant preacher as he makes his way through Herod’s domain, and yet even here, with his life threatened by the “fox,” Jesus keeps himself focused on a larger concern. When Jesus refers to himself as a mother hen, and laments the history of Jerusalem as “the city that kills the prophets and stones those who are sent to it” (Luke 13:34), we realize that the “fox” he is referring to is something bigger than Herod Antipas, first century Palestinian Jew. Jesus is really, is really talking about an understanding of the world and it’s power structures that stand in opposition to the vision, the dream of God for all creation. The “fox” in this parable represents our tendency to take what we need, to subjugate others to our agenda, to marginalize and to ride roughshod over the poor, the weak, and anyone else who doesn’t have or can’t wield the power that we think we have and deserve. Jesus is telling us that the “fox” is already in the henhouse and that there is a choice to be made. Are we going to align ourselves with the fox, in the hopes that we might be spared by the preservation of the status quo; that we might be allowed to continue to run our own little corner of the henhouse; or are we going to cast our lot in with the mother hen, who has been trying for so long to gather us under her wings and shelter us from the power that would destroy us? There is a choice to be made and, given the choice between a fox and a Mother Hen, the fox at first blush, might seem like a better choice. On the surface the Fox seems more powerful and attractive. The Fox offers perks and benefits, privilege and status, rank and recognition. The Fox would seem better equipped to defend itself and to defend us. Surely we can cultivate and tame the fox’s rage and penchant for blood, using it to our own benefit. But there is this little problem with putting the Fox in charge of the henhouse. The Fox has a tendency to sneak in when no one else is looking, in the dead of the night, seeking to slake its hunger. And when we finally wake up and take stock, we will see that some of us are missing, or injured, trampled into the hard scrabble of the henhouse floor by the Fox’s destructive rampage. Once we have let the fox into the henhouse there is just no telling who might be deemed disposable, be discarded, be left out, or even go missing altogether. Yes, the fox is powerful, but in the end, no one is safe when there is a fox in the henhouse. Standing here this morning, the slope of the Mount of Olives at our back, the ground before us falling away to the Kidron Valley, the Garden of Gesthemane down there at the foot of the hill, and the Temple Mount rising before us across the valley, the slope is covered with graves. The people of Israel have chosen the hill that is the Mount of Olives for a public cemetery. And in that rocky and steep soil, burials are above ground in stone crypts. And standing there you can see that the hillside is littered with the graves of the children of Jerusalem. Right at our back is a Franciscan chapel called Dominus Flevit, which means “the Lord has wept.” And on the chapel altar is a mosaic, a picture of a mother hen with her wings spread wide, trying her best to look as ferocious as a mother and can look, with her chicks gathered up under her wings. Here in this place Jesus is telling us your house is “left to you,” another way of telling us that our henhouse is left desolate, because we have refused to shelter in the shadow of the wings of the mother hen. Why are we so unwilling to turn our backs on the fox and cast our lot with the love of the Mother Hen? It’s a frightening thing to reject the fox. It is even more frightening to step into the shadow of the Mother Hen’s wings because, as Jesus is pointing out when he shifts the definition of “fox” away from Herod and towards a view of the systems and structures that dominate and shape our lives, the choice we make will ultimately define the way that we live together, and who we are. Now I said that in this passage, Barbara Brown Taylor asks a question. But you may have noticed that the end of that quotation there was a period and not a question mark. But you know… today’s Gospel reading didn’t end with a question mark, and there’s still a question there. It’s implicit in the clear distinction between two ways of seeing, being, and living in the world. Jesus is asking us to turn away from the way of the fox; to stop participating in structures that oppress, crush and destroy; to recognize that the fox under whose standard we are gathered, will not recognize our past loyalty and support, but will destroy as all without regard or distinction. Jesus is asking us to gather under the shadow of his wings and to let him rescue our humanity from the hard scrabble of the henhouse floor. This sermon, offered by The Rev. 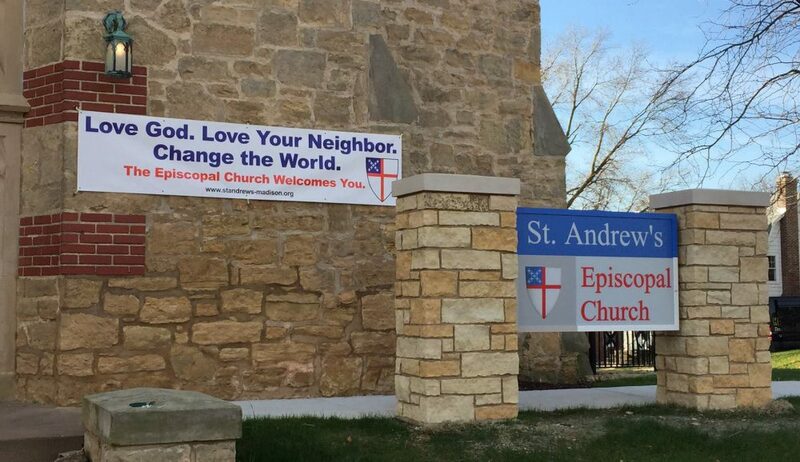 Andy Jones at Saint Andrew’s Episcopal Church in Madison, Wisconsin, on March 10, 2019, is built around the readings for the 1st Sunday in Lent in Year C of the Revised Common Lectionary. It almost seemed like a dirty trick yesterday afternoon at about 6 o’clock when the snow was blowing sideways past my kitchen window. Here we are. It’s the first Sunday of Lent 2019, the first day of daylight savings time, in the middle of the winter that just won’t let us go. So I think it might be a good idea in this morning for us to turn our mind to some, perhaps, happier moments. I’d like to ask you all for just a minute to close your eyes and remember how you felt in those moments that seemed to change everything. Maybe it was the moment you got picked for the team, or for the show. Maybe it was graduating, or being accepted to school. Maybe it was when that one person said yes, or asked. Maybe it was the moment you learned that you would become a parent… Think about the joy that you felt in those moments, the astounding way that your body felt alive, your heart pounded in your chest, as the possibilities opened up before you. And then, acknowledge with me if you will, the anxiety that came just a little while later. Will I be good enough to stay on the team? What kind of actor will I be? What kind of student will I be? How will I study and what will I study? What kind of partner, what kind of parent will I be? And how will I know how to do all of these things? He must have been ecstatic to finally, finally understand and to be able to make sense of all of those stories… I wonder if that joy even lasted until his feet were on dry ground there on the banks of the Jordan. What does it mean to be the son of God, the Beloved? What is it that I’m supposed to do? How will I be this person? The next thing that happens in Luke’s Gospel, after a short insertion of Jesus’s genealogy to give us the reader some evidence that this is in fact true about Jesus, Jesus goes into the wilderness. Now it’s important to note that in Matthew and Mark Jesus doesn’t seem to go of his own accord. In one of those versions he is led by the Spirit into the wilderness. In the other he is driven into the wilderness. But here in Luke’s Gospel it says that the spirit led him in the wilderness. It’s like he went there of his own accord to work this out. To think about it. To ponder just what it might mean. To ponder his vocation and how he would live it out… and once he got there the spirit managed what would come next. Jesus returns from the wilderness with the understanding that his vocation, his mission, is to proclaim release to the captives, recovery of sight to the blind, to proclaim the year of the Lord’s favor. But an understanding of his mission and his vocation isn’t the only thing that he gained in the wilderness. He also learned, or declared how, he would live out that vocation. Luke tells us that the devil came to him and said, “If you are the son of God turn this stone into a loaf of bread.” Surely, if it’s your mission and vocation to set the prisoners free, to proclaim the year of the Lord’s favor… if you can snap your fingers and feed people they’ll get right in line. They’ll do exactly what it is that you ask them to do because you will be able to meet all their needs. Jesus turns his back on that temptation. So the devil tries again and takes him up and shows him all the kingdoms of the world and says, “If you are the son of God just take it it’s mine I can give it to you” and you will be in charge. You can tell them what to do and they won’t get right in line. You will have the authority to demand that they release the prisoners; they take care of the blind, the lame, and the sick, the poor… All you have to do is worship me and you will have the power to make them do whatever you want. But Jesus says no. Certainly, he would be a benevolent dictator, a benevolent autocratic ruler, but that’s not the way that Jesus chooses. So the devil tries one more time, and takes him to the pinnacle of the highest point of the Temple, and says growing yourself off. Because if you’re the son of God the Angels will catch you before you hit the ground, and people will see that, and they’ll know without a doubt, in an instant, that you’re the one to follow. And they’ll jump right on board with whatever you tell them to do, because it would be foolish to not do what you say. And again, Jesus turns his back. William Temple, who was the Archbishop of Canterbury for a few short years in the 40s, his tenure was cut short by his untimely death, speaks about The Temptations in the Wilderness as the temptation to coercion. Buy their allegiance. Force their allegiance. Prove that it would make no sense to do anything but get in line and follow you. All of those William Temple calls coercion because what God really wants, and what Jesus really wants in this moment, is not our allegiance. It’s not our trembling obedience. It’s our love. God wants us to love. And love cannot be coerced. I’m sure William Temple had never heard this phrase but you all have heard it, “If you can’t say no, it’s not love.” If Jesus were to try and buy us, by turning stones to bread, that wouldn’t be love. Forcing us wouldn’t be love. Even proving, as a matter of science, who he was, would deny us the ability to choose. And it’s only when we can choose, that love is possible. So, Jesus instead, walks out of the wilderness and chooses the path of the suffering servant, and it makes himself vulnerable to us, in the hope we will love in return. That’s really great news if you think about it. Now it might be more expedient… It might have remedied a lot of the world’s problems that Jesus had chosen one of those other paths; if he was turning stones into bread, and feeding the poor; or making autocratic leaders who aren’t so benevolent step in line because he had the power to force them; or proving that it’s for our benefit, or to our benefit, to live the life to which he’s calling us. But any of those paths would have made us less human than we are capable of being. It would’ve denied us the ability to choose to love even when the evidence all points to the contrary, or when it might be easier to choose other paths to achieve laudable goals. It’s good news that God wants us to love. And I think it’s very instructive to us as we enter the wilderness of Lent, to spend our own 40 days trying to discern how to live out our identity, given to us that our baptism, as beloved children of God with whom God is well pleased; as we try to figure out how we will live in this world, seeking to realize God’s dream and vision for creation in our own lives and in the community around us. It might feel good to get self-righteous and indignant and angry. It might feel good to yell and demand. But what Jesus does in the wilderness is turn his back on those behaviors, and to reach out, making himself vulnerable, and hoping that the relationships that are forged will lead to a community that lives its life together in light love and grace. As we make our way through these 40 days we may have the opportunity to discover, within ourselves and in our lives, places where our anger, or our impatience, or our need to be right and to have the right answers, or to know the right way of doing things, gets in the way of love. We may find those things within ourselves impacting our families, our workplaces, the people with whom we interact in the marketplace, and in the voting booth. But in this moment, as we began our journey through the season of Lent, we are called to do the same thing that Jesus did; to walk out of the wilderness with our humanity intact, whole, loving, forgiving; willing to be vulnerable to change, to the needs of others and to their place in this garden with us. Forty days. Forty days in the wilderness. Forty days in the season of Lent, with God as both our destination and our companion on the journey. Today we get a true gift, the knowledge, the truth, the understanding that it’s all about love; loving ourselves, loving our neighbor, and loving God with all of our heart, soul, mind, and strength; in the wilderness, at home, wherever we are. Love. This sermon, offered by The Rev. Andy Jones, on March 6,Ash Wednesday, 2019, is built around the readings assigned for Ash Wednesday and the Invitation to The Observance of A Holy Lent found on page 264 of the Book of Common Prayer. May the words of my mouth, and the meditations of our hearts, be always acceptable in your sight, O Lord, our strength and our redeemer. Amen. It is to be sure a remarkable thing that we do this day. Wednesday, a work day, the middle of the day, 16° outside, and we have come together to take the first steps on a difficult and perilous journey; a journey that will be marked by beatings, imprisonments, riots… Oh, no wait. That was Paul’s journey. Our journey will be marked by self-examination and repentance, by prayer fasting, and self-denial, and by reading and meditating on God’s holy word. Not easy disciplines to keep. If they were easy, there would be no need to invite us all to enjoin in these practices at this moment. So, this journey through the season of Lent will be difficult. And while we’re not likely to suffer imprisonment, riots, labors, it will be a perilous journey; because during this season of Lent we will be called to look inside of ourselves and to see with God’s eyes; and to dare to name those places within us that we would rather not expose to anyone, maybe even to ourselves. We will be called to identify those places in our lives that don’t fill us with joy and life, but which cause us some degree of pain, and shame, and discomfort. And during this season we’ll be called to wrestle with those things, and, perhaps limping for the rest of our lives, walk away from them, turning our backs on them, and turning back to God, the one who gives us light and life and joy. So, it is a difficult and perilous journey that we undertake this day. And even more remarkable, I think, because in just a few moments we’ll come forward and kneel at this rail, and be reminded of our own fragility, our mortality. We’ll kneel here at the rail and have ashes smeared on our foreheads in the sign of the cross, and hear the words, “remember that you are dust and to dust you shall return,” a reality that most of our culture would like to ignore or even deny. And yet, we will come forward today and volunteer both for this journey and for this reminder. Then, just a few minutes later, we’ll return to this rail, and we’ll hold out our hands, and ask for help. We’ll hold out our hands and receive the symbol and the sign of God’s ongoing presence in our midst and in our lives. We’ll hold out our hands and we’ll be reminded that, even as we walk this journey, seeking to rid ourselves of the things that hold us back, the things that chain us, God is walking by our sides. Even as we seek absolution, we are being forgiven. Even as we work to come closer to the heart of God, God is before us, behind us, beside us, within us; moving us along this path, holding us up and showing us the way. I think it’s probably accurate to say that without that reassurance of God’s presence, and love, and forgiveness; without the promise of that new light that will break at the end of this journey, we might not dare to take these first steps. Even together, this journey would be terrifying, if not for the truth, and the faith, and the belief, that at the end of this journey is God; and for this reminder that on every step of the way, as we make that journey to our destination, God is by our sides. So, this day we come together to begin a journey that will lead us ever deeper into the heart of God, and allow God’s light, and life, and love to shine more brightly within us and around us. This sermon, offered by The Rev. Andy Jones at St Andrew’s Episcopal Church in Madison, Wisconsin on December 24 2018 is built around the readings for Christmas I in the Revised Common Lectionary. It’s really great to see you all as we gather around the manger to celebrate the birth of Jesus, the Christ, Emmanuel, God with us…! You know nothing draws a crowd like a baby. They’re like a magnet. Sometimes, when there’s a new baby here on Sunday morning, the parents never make it to coffee hour because people swarm around them up here in the nave, just wanting to get close to the baby. But who’s to blame us right? Babies are amazing. When we are around a newborn child we feel a special sense of connection, wonder, and awe. But I would suggest that there’s something else about babies that draws us in. They are dependent on us for everything. They need us to feed them, change their diapers, to protect them, to shelter them. They need us to interpret and understand when something is wrong and to know what to do about it. And the miracle in all of this dependency… Is that it doesn’t push us away. It actually draws us in. In one of her TED Talks, Dr. Brené Brown, a research professor at the University of Houston, tells how her research has found that people who express a true sense of connection with the people and the world around them are people who embrace vulnerability. We see a baby, totally dependent on us for everything, and their vulnerability draws us in because, somehow, we sense in that moment the possibility of something of which we can never have enough, joy, creativity, belonging, love. There are other “places” where we might risk being vulnerable; music, art, the theater, even at the movies. But these can be solitary places. We close our eyes. We go inside. We may sit “together, but we do it in a darkened room. But when we come together around that miracle of new life, when a newborn child is placed in our arms, when we see the potential that child represents, the risk undertaken in coming into the world; we can be moved to a place of vulnerability ourselves. No wonder we’re all here. No wonder we need to bend the rules to let everyone, and I mean everyone, into the delivery room tonight. The birth of a child is a gift that can help us to enter into a space for which we all desperately long. And this crowd? All of us here tonight, squeezed in around the manger? Well, this isn’t just any child. This is God coming into the world, Emmanuel, God with us. Here by the manger we begin to realize that this place, this moment of tender connection, of risk, of vulnerability is the “place” where God lives. That’s really hard to imagine. But joy, creativity, belonging, love, those things sound like God, don’t they? God is here with us, as a newborn child, defenseless, dependent on us for everything… to affirm the value of vulnerability. And to model a way of being that will help us to see, to experience, to live in the world in a new way; a way that leads to the peace of God which passes all understanding. Tomorrow, or later this week if you are lucky, when you go back into those other places, those same pressures will be there, trying to discourage you from being vulnerable, trying to get you to rebuild the walls that separate us one from another, from God, and even from ourselves. Those same pressures will be there, asserting that this was only a dream, that it isn’t real; trying to drag us from the manger and the truth that we have found here. This sermon, offered by The Rev. Andy Jones at St Andrew’s Episcopal Church in Madison, Wisconsin on December 23, 2018, is built around the readings for the Fourth Sunday in Advent in Year C of the Revised Common Lectionary. I almost made it. I’ve done a lot of my shopping on line. I’ve stayed out of the mall all season. I thought I had escaped. But on Thursday this past week I took the day to run some final errands. I walked into the SERV store on State Street and it got me, an instrumental, made for the elevator in a doctor’s office version of…. The Little Drummer Boy! I don’t know why I dislike that song so much. It might have something to do with that awful, Claymation, made for TV Christmas Special and the way it scared my kids when they were growing up… More likely it has to do with repetitive melody, and the lyrics… pa rum pum pum pum? Come on. But this week I’ve had a change of mind. All week long, as I worked with today’s lessons another song kept insinuating itself upon my consciousness. I didn’t think that it was possible, but this song has supplanted The Little Drummer Boy at the top of my Christmas no play list. “In the sixth month the angel Gabriel was sent by God to a town in Galilee called Nazareth, to a virgin engaged to a man whose name was Joseph, of the house of David. The virgin’s name was Mary. And he came to her and said, ‘Greetings, favored one! The Lord is with you’” (Luke 1:26-28). “Here am I, the servant of the Lord; let it be with me according to your word” (Luke 1:38). Elizabeth was already six months when Mary got the news, add to that three weeks of travel and the three months that Mary stayed with Elizabeth before she gave birth. That tells us that Mary didn’t waste any time getting on the road to go see Elizabeth. She must have saddled up her donkey and left the next morning! Maybe she rushed into the country side to see Elizabeth because she needed some confirmation, to hear that something, anything, that the angel had said was true. If Elizabeth was indeed expecting a child, then maybe the angel had been right about what would happen to her! She was in a hurry but she had plenty of time to think. Three weeks on the road, to ponder what it meant for her, an unwed woman, engaged but not yet married, to be found pregnant. What would Joseph say? What would her family say? What would the people of village say when they found out? “And now, you will conceive in your womb and bear a son, and you will name him Jesus. He will be great, and will be called the Son of the Most High, and the Lord God will give to him the throne of his ancestor David. He will reign over the house of Jacob for ever, and of his kingdom there will be no end” (Luke 1: 31-33). “…the child to be born will be holy; he will be called Son of God” (Luke 1:35b). Three weeks to ponder, to wonder, to think about how she might be received if she returned home pregnant; and what it might mean if God did indeed come into the world through her, an unmarried peasant girl from a small insignificant village in the Galilee. So, can you imagine how she felt as she drew near Elizabeth’s house? I am sure that the closer she got, the more excited she became, the more her heart raced. I can just see her running from the yard to the door, calling out to her cousin… Elizabeth?!? Elizabeth?!? ”When Elizabeth heard Mary’s greeting, the child leapt in her womb. And Elizabeth was filled with the Holy Spirit and exclaimed with a loud cry, ‘Blessed are you among women, and blessed is the fruit of your womb. And why has this happened to me, that the mother of my Lord comes to me? For as soon as I heard the sound of your greeting, the child in my womb leapt for joy. And blessed is she who believed that there would be a fulfillment of what was spoken to her by the Lord” (Luke 1:41-45). It’s incredible, almost beyond belief! Elizabeth is pregnant! Her unborn child recognizes the presence of the child that Mary is carrying! And Elizabeth knows without Mary even telling her, that Mary is pregnant! “And Mary said, ‘My soul magnifies the Lord, and my spirit rejoices in God my Savior, for he has looked with favor on the lowliness of his servant. Surely, from now on all generations will call me blessed; for the Mighty One has done great things for me,and holy is his name’” (Luke 1:46-49). I know it must feel like it was a long time ago, but remember when I was going on about a Christmas song that has been on my nerves all week? Here’s where it wants to play. It’s a beautiful song, and I can certainly understand why people find its presentation attractive, but it robs us of an essential part of Mary’s story. A part of her story that we really need to hear, now, today! “He has shown strength with his arm;he has scattered the proud in the thoughts of their hearts. He has brought down the powerful from their thrones, and lifted up the lowly; he has filled the hungry with good things, and sent the rich away empty” (Luke 1:51-53). “…has helped his servant Israel, in remembrance of his mercy, according to the promise he made to our ancestors, to Abraham and to his descendants for ever” (Luke 1:54-55). Mary did you know? Yes! It’s important that we recognize, and not diminish or romanticize Mary’s part. Here, in the Magnificat, in Mary’s song of exultation and joy, we hear her full-throated, rebellious, proclamation that God is doing a new thing and setting about to change the world on our behalf! Yes, Mary knew! And that’s a part of the story that we can’t afford to lose. It’s important for us, here on the fourth Sunday of Advent, after weeks of longing and waiting, to be sure we understand what we are asking for. And Mary is here, singing her own song, in her own voice, to help us see the truth of the choice that lies before us in these coming days. Emperor Augustus has decreed that all the world should be registered. The whole world is on the move crossing borders, looking for home. Mary and Joseph are almost to Bethlehem where they will be looking for a place to give birth to the child… to bring the Light of God into the world. Tired, hungry, road weary, having traveled a great distance, they will come knocking on our door, asking us if we have room to let God in. What will we do? Will we decide that we have too much to lose? Will our wealth, our abundance, our pride, our need to preserve our own power, lead us to tell these travelers that they need to move along. Find another place. There is no room here for what you bring. Or will we, like this powerful young woman, have the faith to say, ‘Here am I, the servant of the Lord; let it be with me according to your word…’ throw open the gates, and let them in?